Top Line Roofing Ltd is your source for commercial sheet metal wall systems in Victoria. From aluminum composites to sheet metal cladding, we have the systems you need to keep your building envelope protected against the elements. We are a family owned and operated company that has been building a strong reputation for service since 1983. Our team is concerned with ensuring the accuracy and reliability of our installations at every step of the process. We conduct detailed in-person consultations where we can evaluate all factors that may play a role in the project and present you with a comprehensive quote for the work. For more information on the different types of wall systems we offer, please see the additional information on this page. Want to get started? Contact us today to book your appointment and discover the meaning of true customer service! Composite wall panel consist of a metal sheet bonded to a foam core. The shell provides protection to the insulation, increased rigidity and is a built in vapor barrier, while the integral foam core provides thermal insulation. The panels fit together with a tongue and groove joint that when caulked provides an excellent seal. Panels are available with an aluminum shell, called aluminum composite material, as well as zinc and copper. Composite wall panel can be formed into tight radii, angles and most shapes, while being very resistant to buckling, dimpling and oil canning. Composite wall panels come in a wide variety of colours and finishes. Preformed insulated panels offer high insulation value as well as quick installation to your project. The single piece insulated panel eliminates the inefficiencies of multi piece field assemblies, while attaching to the outside of the building to eliminate thermal bridging and maximize thermal efficiency. Preformed insulated panels speed up construction time by combining the insulation, air and vapor barrier and the exterior cladding into a single easy to install unit. Preformed insulated panels come in a wide range of sizes, colours and textures. 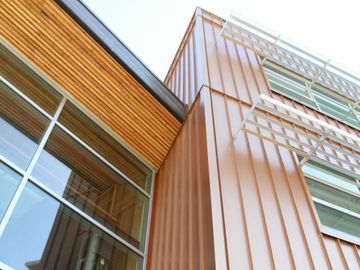 Standing seam and bold form metal siding both make excellent siding choices. Standing seam metal siding is fabricated on site with our roll forming machine, producing long panels allowing for few to no seams. 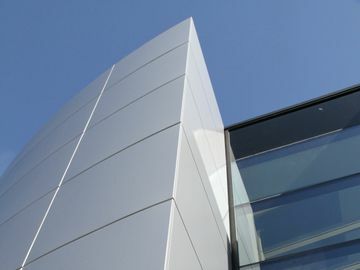 Standing seam panels clip into each other along the protruding seam, giving a look reminiscent of board and batten when installed vertically. Bold form siding comes in several different styles. Instead of the flat panels with protruding seams of standing seam, bold form is pre-bent to form corrugations in the metal of various styles. The different styles of corrugation can greatly change the look of the building. Both products come in various colours and metals. Metal siding is lightweight, low maintenance and has a great life expectancy. Top Line Roofing Ltd in Victoria is dedicated to providing superior customer service at all stages of the roofing process.